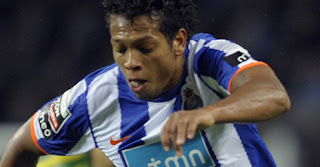 Chelsea manager Andre Villas-Boas will square off with former mentor and Real Madrid boss Jose Mourinho for FC Porto midfielder Fredy Guarin. The 25-year-old has emerged, at £15million, as a cheaper alternative to Tottenham’s Luka Modric with the Blues on the hunt for a creative midfielder. The Colombia international made 22 league appearances under Villas-Boas last year and helped the Portuguese club seal an historic treble, according to TalkSport. Guarin can play in central midfield or on the right and scored five goals in Porto’s successful Europa League campaign - a strike rate which attracts the new Blues boss. He played only 34 minutes of the Super Cup game against Vitoria Guimaraes and does not fit in with new Porto coach, Vitor Pereira, plans for the new season. After failing in a bid to sign Radamel Falcoa and Joao Moutinho from his former club, Chelsea boss Villas-Boas is attempt a third bid for one of his former charges.